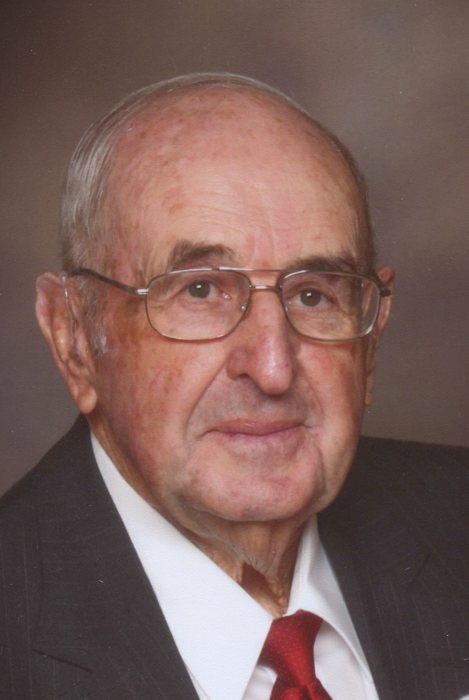 Duane (Duke) William Holmes of Vernal, Utah passed away April 11, 2018 in Vernal, Utah. He was born on May 14, 1931 in Vernal, Utah to William Wallace and Emma Christine Holmes. He married Gaila Renae Timothy on Nov. 2, 1959 in Las Vegas, Nevada and was later sealed in the Salt Lake Temple in 1965. They have 3 children Mark (Kaylynn) Holmes, GayLynne (Kurt) Case, and Michael (Fawn) Holmes. He served honorably in the Marine Corps. He worked in the oil and gas industry for Chevron and Pennzoil for over 30 years. He is a member of The Church of Jesus Christ of Latter Day Saints, where he served in many church callings. He also served as a temple worker in both the Provo, UT and Vernal, UT temples with his wife. He was always a hard worker and would do anything for anyone. He was a great example to his family of love and kindness. Duke loved spending time with his family no matter where they were or what they were doing. He loved having the grandkids around to spoil with peas from the garden and jelly beans from the special jar by his chair. He loved to fish and spent many hours at many streams and lakes all over the mountain. He loved to go camping and spending time in the mountains, in a chair, whittling wood into treasures for his family. He loved to plant a garden every year and shared his harvest with family and friends. He could tinker in his wood shop for hours, and he always had the best Christmas light displays every year. For every special occasion that came along, Duke never forgot to send flowers to his sweet wife. He was the best husband, dad and grandpa ever. We will miss him greatly, but we are secure in the knowledge that we will see him again. (KayLynn) Holmes, GayLynne (Kurt) Case, and Michael (Fawn) Holmes. 12 grandchildren, and 16 Great-grandchildren. Also 2 brothers, Mac (Marion) Holmes, and Lyle Holmes, all of Vernal. And many nieces and nephews. He is preceded in death by his parents, William and Emma Holmes, 3 brothers, Don Holmes. Glade Holmes, and Glen Holmes, and 2 sisters Barbara Caldwell and Lorraine Slaugh. Funeral services will be held Saturday, April 14, 2018 at 11:00 am at the Davis 4th Ward Chapel, 3990 South 1500 East. A viewing for family and friends will be held Friday April 13, from 6:00 to 8:00 pm at the Blackburn and Sons Vernal Mortuary and Saturday morning prior to services from 9:45 to 10:45 at the Davis 4th ward chapel. Interment will be in the Maeser Fairview Cemetery with military honors, under the direction of Blackburn and Sons Mortuary.